The ingredients are pretty basic. 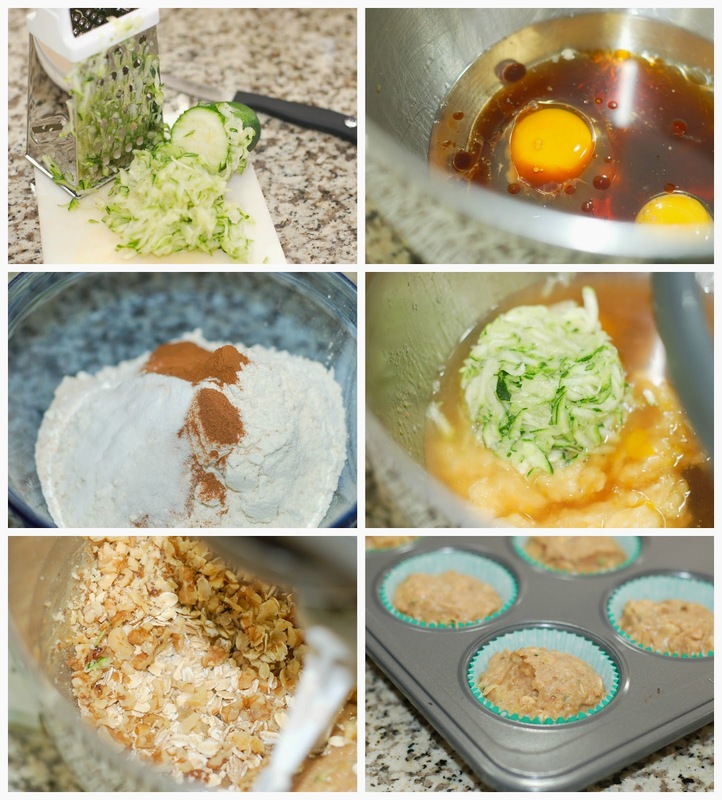 I did add some vanilla extract to these muffins because zucchini doesn't have as much of a sweet flavor as pumpkin. I grated the zucchini by hand, but you can also do it in a food processor. The bananas, I just mash with a fork. When they are over ripe, they are very easy to mash. These are just the prettiest muffins. I love all the green bits of zucchini. I have never peeled my zucchini to bake with it. I just wash the skin and grate it whole. Why waste flavor. 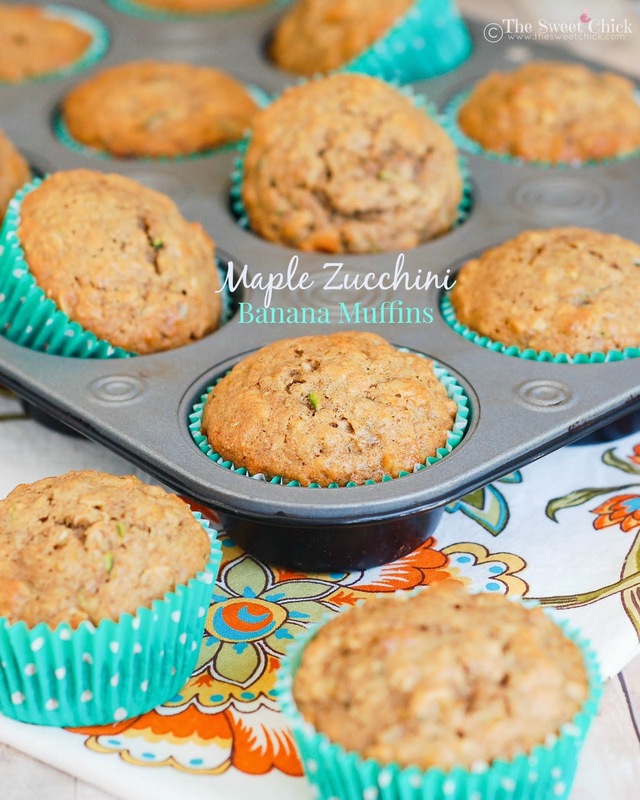 These Maple Zucchini Banana Muffins are perfect for breakfast, coffee breaks, school lunches, or dessert. They don't sit in your stomach like a brick and you don't feel bad eating them. The only problem is stopping yourself from eating more than one. In a stand mixer bowl add maple syrup, oil, eggs, vanilla, and shredded zucchini. Mix on low speed until completely blended. In a medium bowl, combine flours, spices, baking soda, and salt. Mix with a spoon until well blended. 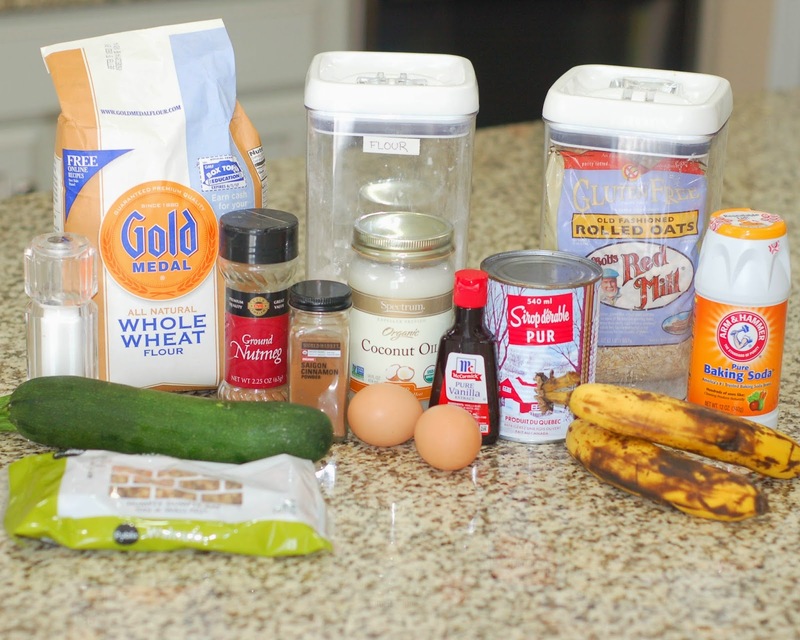 Add the flour mixture to banana/zucchini mixture and mix on low until completely incorporated. Next, add the rolled oats and walnuts, mixing until they are evenly distributed. 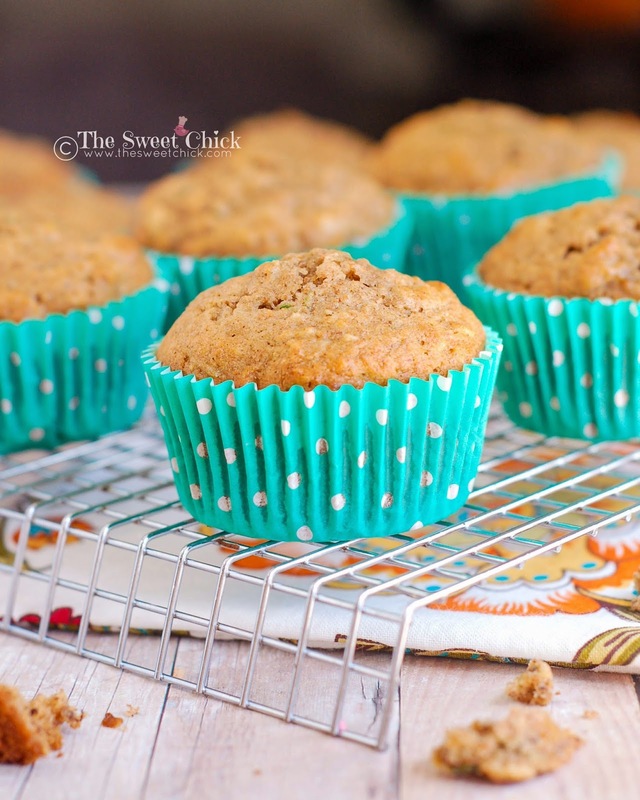 These muffins are freezer friendly. I just defrost them at room temperature and keep them in an airtight container. 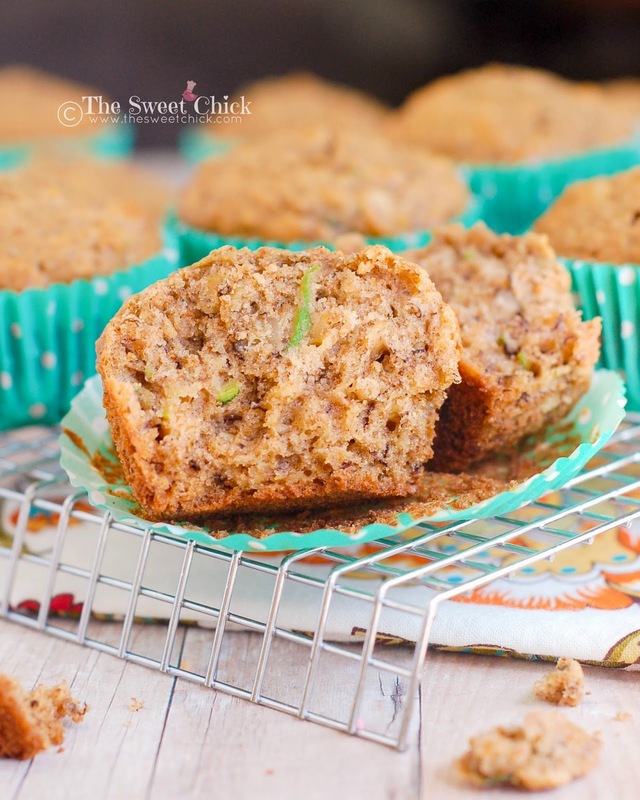 I love to bake with zucchini too:) It adds moisture and I really like it:) These muffins are delicious! Yes, I know what you mean. I always loved when my mom baked zucchini bread. Now I can have the same flavor, but a bit more on the healthy side. 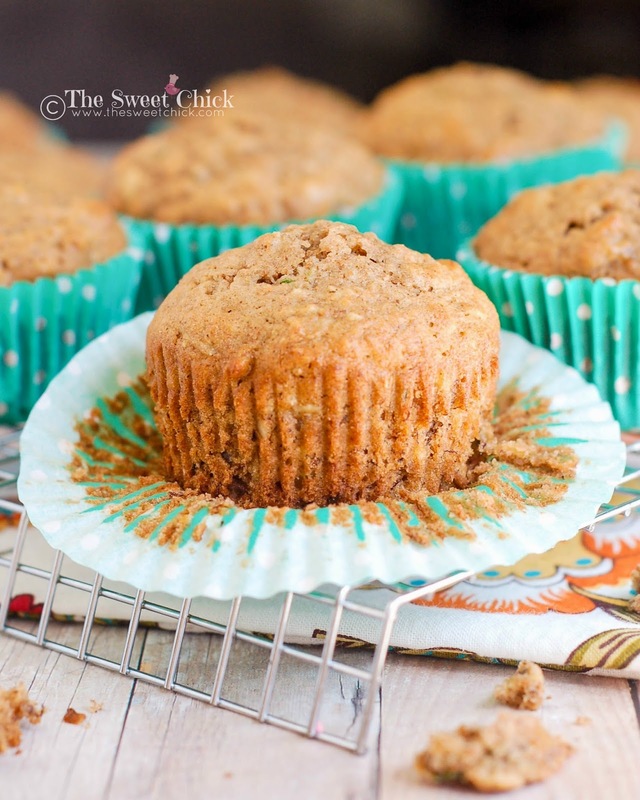 These look delicious...I will have to try using coconut oil...I have never baked with it before, but I am all about "light and fluffy" muffins. We would love for you to join us at Party in Your PJs...I am sure out party goers would love this recipe too. Thank you Kim. Coconut oil does make a difference in baking. I just added these to your party.